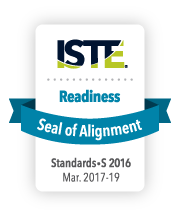 The Google Be Internet Awesome curriculum successfully underwent the International Society for Technology in Education (ISTE) Seal of Alignment review for Readiness. Reviewers determined that this resource helps build foundational technology skills needed to support the 2016 ISTE Standards for Students. The lessons cover four key digital citizenship topic areas: online privacy and security, online interactions, protecting your online reputation, and protecting against phishing and scams. Each lesson topic has an accompanying game that helps reinforce curriculum components in a fun and engaging way. The lessons are geared toward students at the fourth and fifth grade levels and provides helpful information at a time when student safety and security in the online world are of growing importance.